Agriculture—including food, fiber, and forestry—contributes $78 billion to North Carolina's economy and accounts for more than 17 percent of the state's income. North Carolina is one of the most diversified agriculture states in the country, growing over 80 different commodities on 8.4 million acres of land in farms. The state produces more tobacco and sweet potatoes than any other state, and ranks second in Christmas tree cash receipts and in the production of hogs and turkeys. The Western North Carolina region is recognized nationally as a leader in agriculture, with a diverse product line that ranges from Christmas trees, turf farms, and greenhouse and nursery crops to poultry, livestock, trout, and dairy to fresh vegetables and fruits of all kinds. 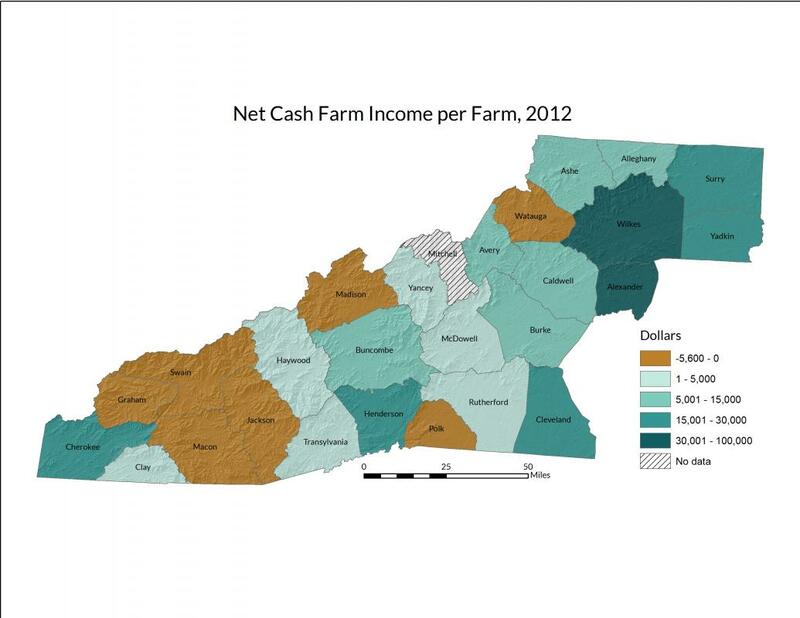 North Carolina net cash farm income totaled over $2.8 billion in 2012, with net cash farm income of just over $198 million in the 27 counties of the region. 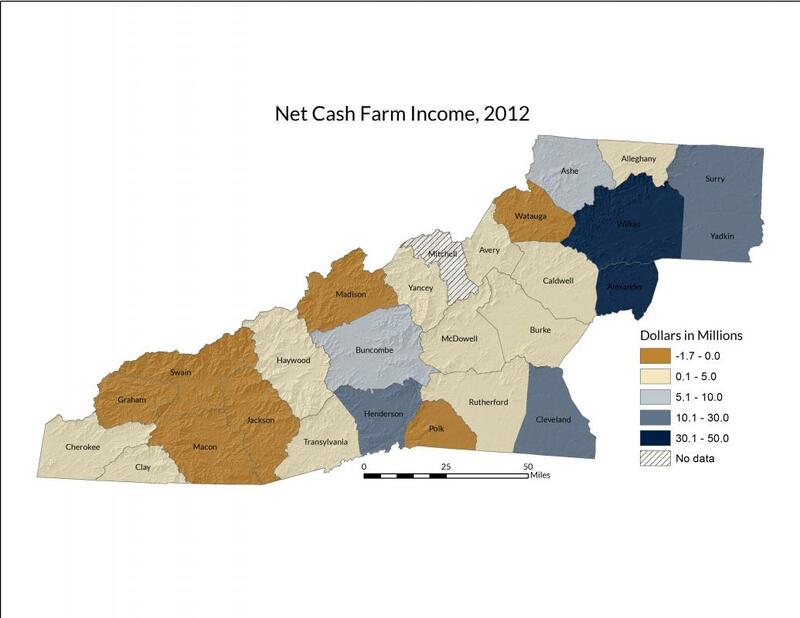 The region's counties accounted for only about seven percent of the state’s total cash farm income, down from around ten percent in 2007. In fact, in 2012, seven of the region's counties—Graham, Jackson, Macon, Madison, Polk, Swain, and Watauga—reported total losses. 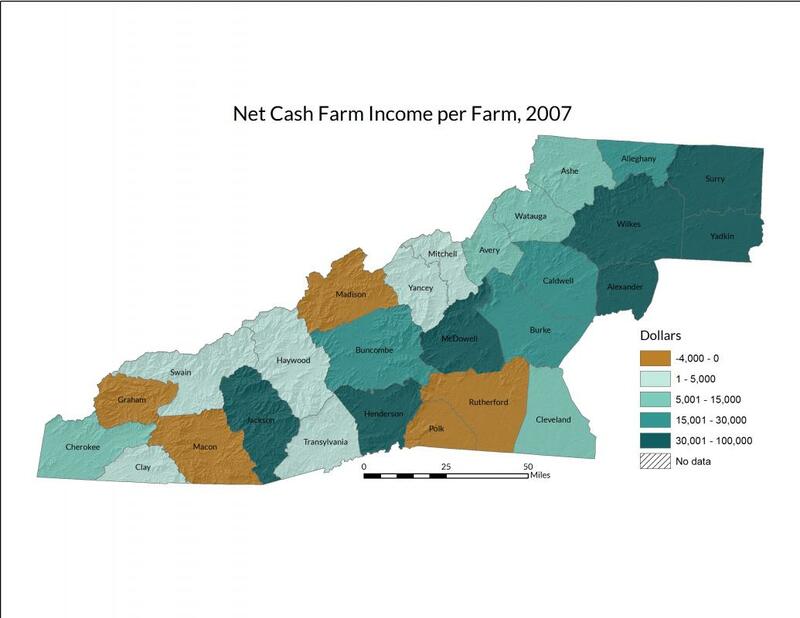 In 2012, Wilkes County had the highest net cash farm income in the Western North Carolina region with $46,753,000, followed by Alexander ($37,191,000), Yadkin ($23,301,000), Cleveland ($19,805,000), Surry ($19,163,000), and Henderson ($11,776,000) counties. North Carolina Department of Agriculture & Consumer Services. North Carolina Agriculture Overview. Accessed September 2015 from: http://www.ncagr.gov/stats/general/overview.htm. U.S. Department of Agriculture, National Agriculture Statistics Service. Census of Agriculture, 2012 Census Publications. 2012 Census Volume 1, Chapter 2: County Level Data. Table 4. Net Cash Farm Income of the Operations and Operators: 2012 and 2007. 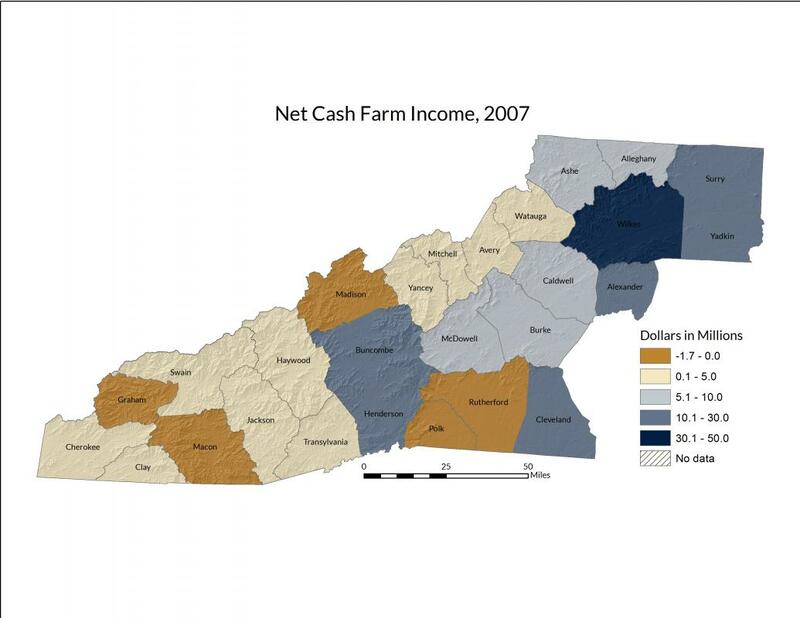 Accessed September 2015 from: http://www.agcensus.usda.gov/Publications/2012/Full_Report/Volume_1,_Chapter_2_County_Level/North_Carolina/. Statistics used are "net cash farm income of the operations," derived by subtracting total farm expenses from total sales, government payments, and other farm-related income. Depreciation is not used in the calculation of net cash farm income. Net cash farm income of the operation includes the value of commodities produced under production contract by the contract growers.